Subway style from nature brown slate mosaic subway backsplash tile ideas pictures and projects. Subway slate for kitchen backsplash, bathroom and walls. @Oak kitchen cabinets, gold granite countertop and black apliances with brown slate mosaic subway backsplash tile. Light oak cabinets with a light oak crown, wood framed window in the opening behind the sink, golden countertop with random size brick look slate mosaic backsplash. @Black countertop with a brick look slate mosaic tile with random size pieces. Off-white grout used to enhance the brick look effect. @Black countertop with 4″ granite backsplash and random size brick looking slate mosaic tile. @Black fireplace surrounded by multicolor slate mosaic tile in brick look pattern with small and large pieces. @Black 4cm quartz counter, two level island in the middle with hightop chairs. Red oak cabinets and stainless steel appliances. Multicolor slate with a brick look pattern backsplash running all the way up to the ceiling behind the hood area. PHOTO CREDIT | HP BUILDERS, INC.
@Bar area with liquor bottle display rack made out of solid wood and glass with a slate brick looking mosaic tile in the back, to add a touch of coziness and comfort. @Brick look slate mosaic tile with random size pieces separate with a slate bullnose edge from one layer of 4×4″ slate tiles. @Spacious kitchen area with light pine cabinets on the top and black cabinets on the bottom. 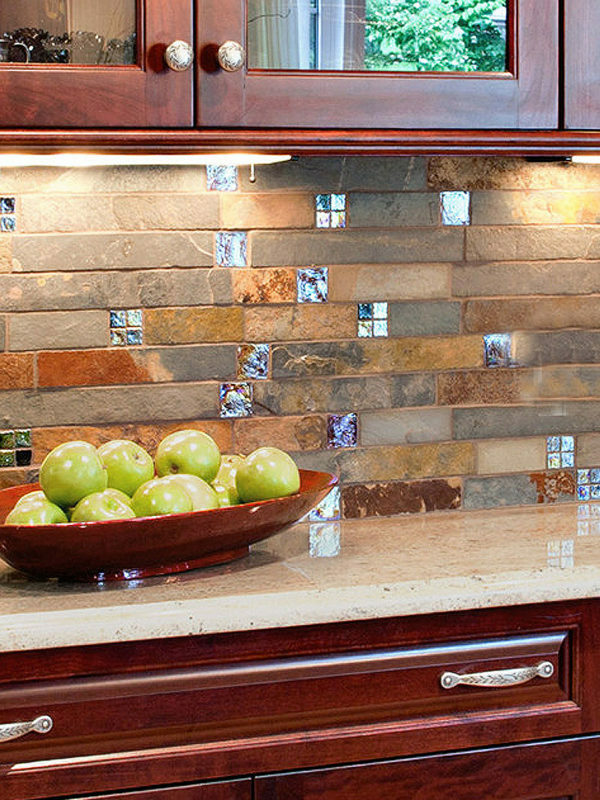 Gorgeous slate mosaic tile backsplash incorporating warm earth tones to add coziness. @Black cabinets on the bottom under black countertop with light pine cabinets on top and slate mosaic tile with a framed accent as a focal point between the stove and the hood. @Slate brick look mosaic tile backsplash running all the way up to the ceiling behind the cooktop and the hood with a framed accent made out the same multicolor slate tile in a smaller pattern. @Gorgeous and spacious kitchen area with a large island with high top chairs in the middle. Dark cherry cabinets with black countertop on the back with stainless steel appliances and slate mosaic tile backsplash.